Heat coals or gas grill for direct heat. Gently scrub potatoes. Pierce potatoes several times with fork to allow steam to escape while potatoes bake. Pour 1-inch layer of salt in bottom of 2 disposable aluminum loaf pan, 8 1/2x4 1/2x2 1/2 inches. Place 2 potatoes in salt in each pan; pour salt over potatoes until completely covered. Cover and grill potatoes over medium heat 1 hour to 1 hour 15 minutes or until potatoes feel tender when pierced in center with fork. Carefully remove potatoes from salt. 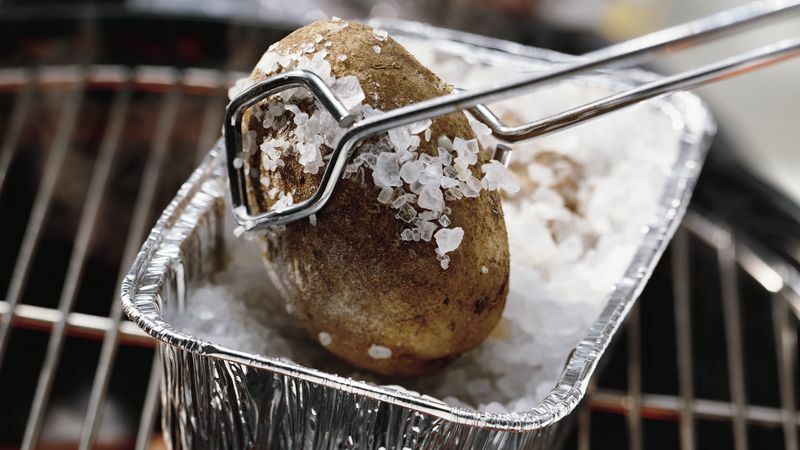 You can reuse the salt for grilling potatoes another time. Store in a resealable food-storage plastic bag.